Valves are weaked arched with a straight to slightly concave ventral margin and a moderately arched dorsal margin. The dorsal margin has 4 to 6 bluntly pointed undulations. The apices are rostrate to subcapitate and bluntly rounded. On the dorsal side, apices are set off from the valve by a shallow notch, resulting in “nose-like” ends. On the ventral side, apices are separated from the valve by a broad, shallow notch where the raphe is positioned on the valve face. 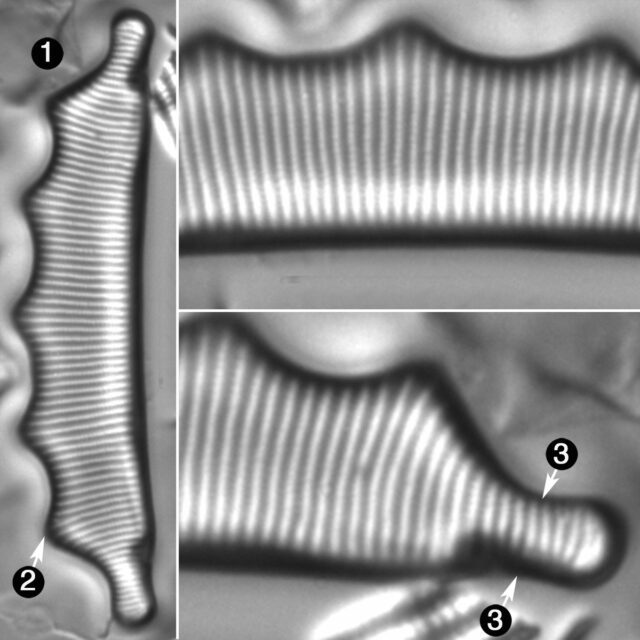 Striae are radiate throughout and composed of very fine areolae, which number 34-40 in 10 µm. Note that valve size is related to the number of dorsal undulations. The taxa E. tetraglyphis, E. pentaglyphis and E. polyglyphis were later names (homonyms) for different sizes of E. hexaglyphis. Eunotia hexaglyphis occurs in somewhat acid to circumneutral waters of very low conductivity. The specimens shown here are from lakes and ponds in western Montana, northern Idaho and the Sierra Nevada Mountains of California. At these sites pH ranged from 5.5 to 7.1 and specific conductance ranged from 10 to 150 µS/cm. Ehrenberg, C.G. (1854) Mikrogeologie. Einundvierzig Tafeln mit über viertausend grossentheils colorirten Figuren, Gezeichnet vom Verfasser. Voss, Leipzig., Pl. 5, II, fig. 23 (iconotype). Eunotia hexaglyphis has large, weakly arched, and more or less linear valves with 4 to 6 bluntly pointed undulations on the dorsal side. Apices Apices are set off from the rest of the valve by broad, but shallow, notches.